Kentucky Auction Academy is pleased to offer our Courses Online! Now you can take courses from the comfort of your home, office or wherever you want! sure your computer will work with the online courses, course fees are non-refundable. Once purchased, you will have access to the course for 30 days. 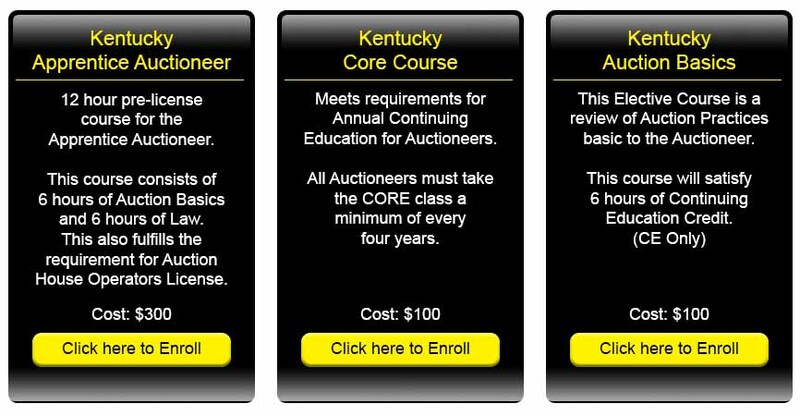 The Kentucky Auction Academy's Online Courses meet the requirements set forth by the Kentucky Board of Auctioneers. The course fees are non-refundable. Please check the Computer System Requirements below before enrolling to make sure your computer will work with the Online course. Once you have purchased access to a course you will have access to the course for 30 days. Cell phones are NOT supported. The latest version of Firefox is recommended. You may also use the latest version of Chrome, Safari, or Internet Explorer. Adobe Acrobat Reader will be needed to view and print the course handouts. Pop-up blockers may need to be disabled to allow the video windows to open. Click here for an illustrated pdf file with step by step instructions for enrolling and taking the online courses. Choose the course you are interested in taking. On the right-hand side of the page you will see instructions on how to create an account. Once you fill out the form to create an account you will receive an email with a link that you must click on to confirm your account. Clicking on the link in your email will take you back to the Kentucky Auction Academy’s Online site. At the bottom of the webpage click on the button that says send payment via PayPal. Proceed with either paying with your PayPal account or, if you don’t have a PayPal account, you can choose the “Pay with a debit or credit card” link below the PayPal login. Once your payment has been processed you should be directed to the course material. If you receive a message stating that your payment has not been fully processed, wait a minute and then press the continue button. After your payment is received you will have access to the course for 30 days. You must watch the entire video to receive credit for that section. When you have finished watching the video, move on to the next topic in the list. You must complete each section in its entirety to receive credit for the course. Upon completion of the course material you will have access to the course evaluation. You must complete the evaluation including your demographic information and Auctioneers License Number (if applicable) to receive credit for the course. Once your evaluation form is submitted, Kentucky Auction Academy will submit your attendance to the Kentucky Auctioneers Board. If you do not complete the course within 30 days, you may request an extension of 15 days for $25. You must request an extension within 5 days of your course enrollment expiration. You must enter the name you are enrolled under in the field below.